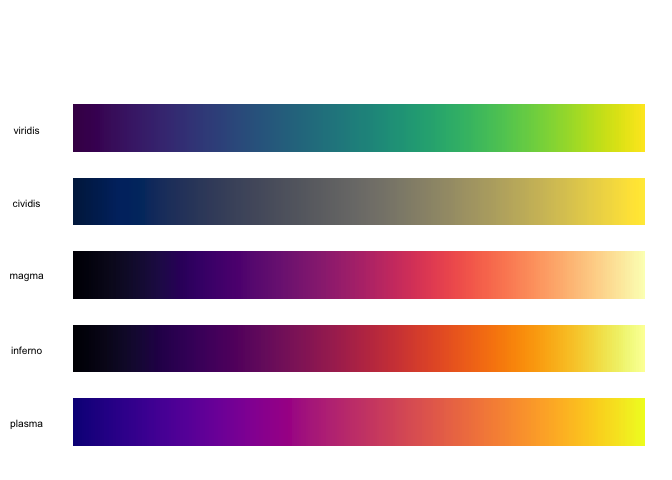 Maps one of the viridis colour palettes, or a user-specified palette to values. Viridis colour maps are created by Stéfan van der Walt and Nathaniel Smith. 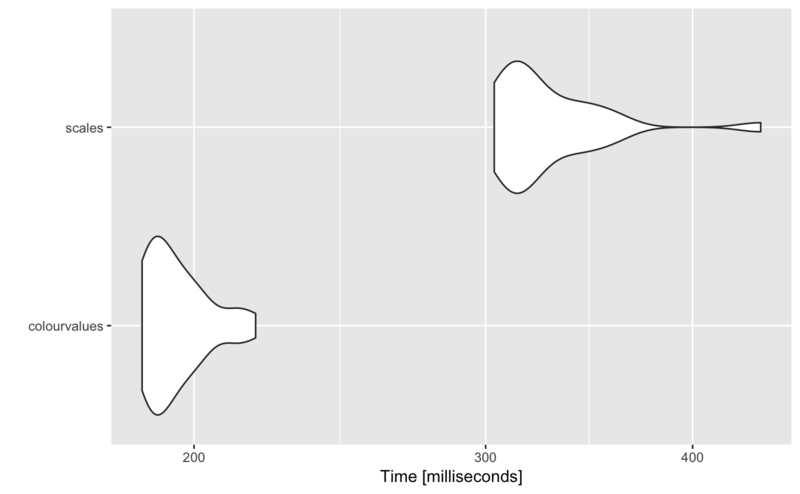 They were set as the default palette for the 'Python' 'Matplotlib' library, introduced at SciPy 2015 conference < http://scipy2015.scipy.org/ehome/index.php?eventid=115969&>. 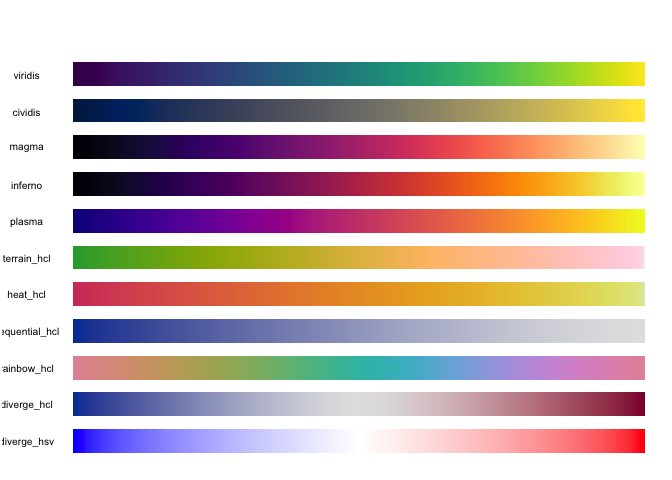 Other palettes available in this library have been derived from 'RColorBrewer' < https://CRAN.R-project.org/package=RColorBrewer> and 'colorspace' < https://CRAN.R-project.org/package=colorspace> packages. It maps viridis colours (by default) to values, and quickly! Note It does not perform a 1-to-1 mapping of a palette to values. 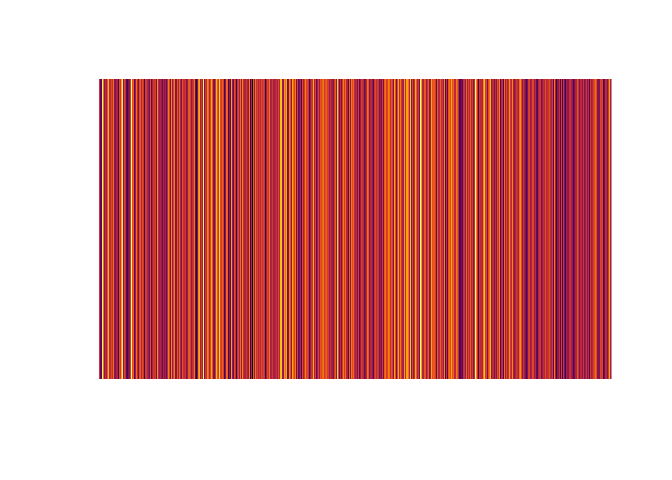 It interpolates the colours from a given palette. I’m aware there are other methods for mapping colours to values. And which do it quick too. But I can never remember them, and I find the interfaces a bit cumbersome. 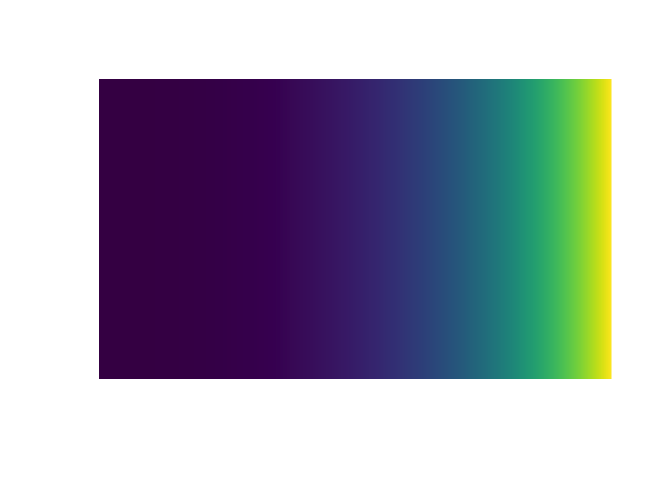 For example, scales::col_numeric(palette = viridisLite::viridis(5), domain = range(1:5))(1:5). I wanted one function which will work on one argument. #  "#440154FF" "#3B528BFF" "#21908CFF" "#5DC963FF" "#FDE725FF"
I also want it available at the src (C/C++) level for linking to other packages. Why do you spell colour with a ‘u’? How can I make use of it in my package? All functions are written in Rcpp. I have exposed some of them in header files so you can “link to” them in your package. If you’re not using Rcpp, just Import this package like you would any other. Are there only viridis palettes? #   "viridis"        "cividis"        "magma"          "inferno"
#   "plasma"         "ylorrd"         "ylorbr"         "ylgnbu"
#   "ylgn"           "reds"           "rdpu"           "purples"
#  "purd"           "pubugn"         "pubu"           "orrd"
#  "oranges"        "greys"          "greens"         "gnbu"
#  "bupu"           "bugn"           "blues"          "spectral"
#  "rdylgn"         "rdylbu"         "rdgy"           "rdbu"
#  "puor"           "prgn"           "piyg"           "brbg"
#  "terrain"        "topo"           "heat"           "cm"
#  "rainbow"        "terrain_hcl"    "heat_hcl"       "sequential_hcl"
#  "rainbow_hcl"    "diverge_hcl"    "diverge_hsv"    "ygobb"
#  "matlab_like2"   "matlab_like"    "magenta2green"  "cyan2yellow"
#  "blue2yellow"    "green2red"      "blue2green"     "blue2red"
Do I have to use the in-built palettes? 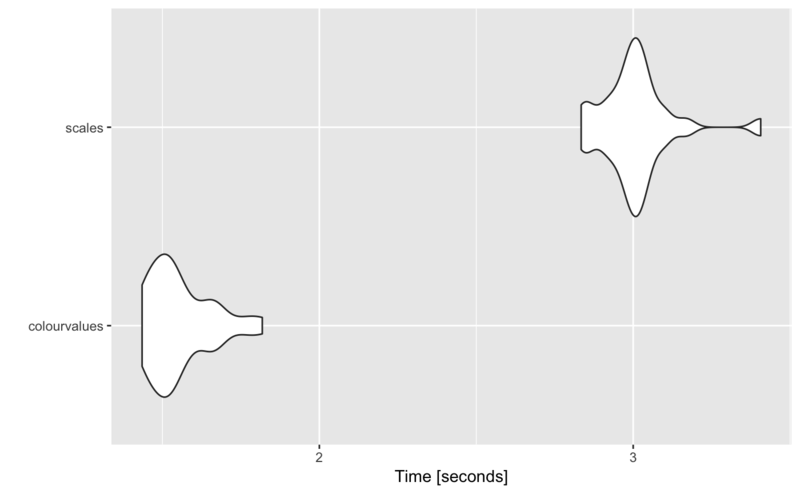 Some of my plotting functions don’t support alpha, can I exclude it? #  "#440154" "#3B528B" "#21908C" "#5DC963" "#FDE725"
Can I get a summary of colours to use in a legend? #   "#440154FF" "#482878FF" "#3E4A89FF" "#31688EFF" "#26838EFF"
#   "#1F9D89FF" "#35B779FF" "#6CCE59FF" "#B4DD2CFF" "#FDE725FF"
#   "#27AD81FF" "#3F4989FF" "#39568CFF" "#218F8DFF" "#228C8DFF"
#   "#FDE725FF" "#440154FF" "#3F4889FF" "#453681FF" "#26818EFF"
You can also use format = FALSE if you don’t want the summary values formatted. #   "#440154FF" "#470D60FF" "#48196BFF" "#482474FF" "#472E7CFF"
#   "#453882FF" "#414286FF" "#3E4B8AFF" "#3A548CFF" "#365D8DFF"
#  "#32658EFF" "#2E6D8EFF" "#2B758EFF" "#287D8EFF" "#25858EFF"
#  "#228C8DFF" "#20948CFF" "#1E9C89FF" "#20A386FF" "#25AB82FF"
#  "#2DB27DFF" "#39BA76FF" "#48C16EFF" "#58C765FF" "#6ACD5BFF"
#  "#7ED34FFF" "#92D742FF" "#A8DB34FF" "#BEDF26FF" "#D4E21BFF"
#   "#2F6C8EFF" "#2FB47CFF" "#482575FF" "#2F6C8EFF" "#43BF71FF"
#   "#3B528BFF" "#414487FF" "#2FB47CFF" "#43BF71FF" "#5DC963FF"
#  "#5DC963FF" "#2F6C8EFF" "#7AD151FF" "#345F8DFF" "#7AD151FF"
#  "#7AD151FF" "#482575FF" "#25848EFF" "#1E9C89FF" "#2A788EFF"
#  "#9AD93DFF" "#3B528BFF" "#481466FF" "#7AD151FF" "#22A884FF"
#  "#5DC963FF" "#21908CFF" "#FDE725FF" "#21908CFF" "#DDE318FF"
#  "#463480FF" "#21908CFF" "#25848EFF" "#2F6C8EFF" "#481466FF"
#  "#25848EFF" "#440154FF" "#BCDF27FF" "#345F8DFF" "#25848EFF"
#  "#440154FF" "#FDE725FF" "#440154FF" "#43BF71FF" "#1E9C89FF"
#  "#22A884FF" "#2F6C8EFF" "#BCDF27FF" "#DDE318FF" "#463480FF"
#   "a" "b" "c" "e" "f" "g" "h" "i" "j" "k" "m" "o" "p" "q" "r" "s" "t"
#  "u" "x" "y" "z"
#   "#440154FF" "#481466FF" "#482575FF" "#463480FF" "#414487FF"
#   "#3B528BFF" "#345F8DFF" "#2F6C8EFF" "#2A788EFF" "#25848EFF"
#  "#21908CFF" "#1E9C89FF" "#22A884FF" "#2FB47CFF" "#43BF71FF"
#  "#5DC963FF" "#7AD151FF" "#9AD93DFF" "#BCDF27FF" "#DDE318FF"
# Coordinate system already present. Adding new coordinate system, which will replace the existing one.